Goals are important if your athletes are to be successful. They are also important for you and your career. 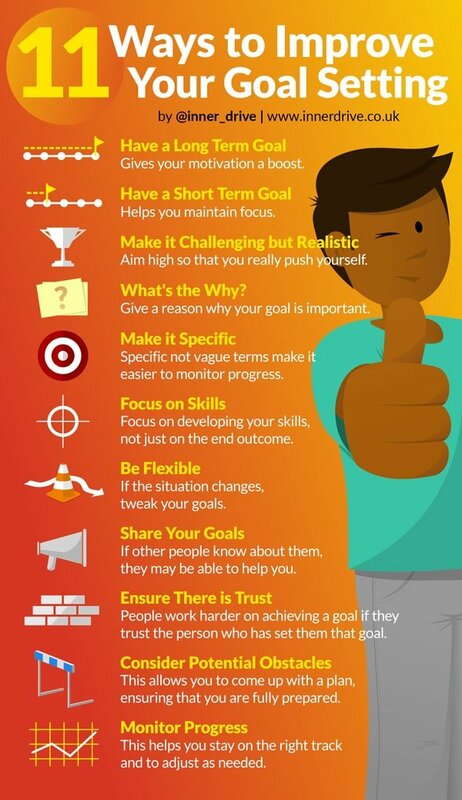 In this post get 11 ways to improve your goal setting. Why do so many people mess up goal-setting? Maybe it’s because goal-setting research has been around for so many years that different suggestions are being made left, right and centre (often with too many acronyms). This causes mixed messages and it just ends up confusing everyone. To combat this, this blog looks at what the science tells us about what actually works in goal setting, and simply suggests simple ways to do goal setting right. Long term goals can help improve your focus, motivation and meaning. Focusing on a long term goal can help you overcome the minor setbacks that inevitably happen along the way. Setting shorter term goals (i.e. what you need to do this week) can help break down a seemingly impossible and distant goal into more tangible simple steps. These small steps can help keep you on the right path and provide short term incentives and accomplishments. If you consistently set goals that you know you can already achieve, you are limiting how much you could potentially improve. You will not be giving yourself the motivation to work any harder than you already are. That is why it is important to make your goals challenging, as this will encourage you to apply more effort, giving you a higher sense of accomplishment once the goal has been reached. Goals that are co-created and agreed between the teacher and student, or the coach and athlete, encourage a sense of ownership. This also has the benefit of letting people know that they are supported, which is needed to excel in pressurised situations. Feeling supported is a big part of how Olympic gold medallists develop their resilience. In addition, team sports should set team goals as well as personal ones, as this will help them work together collectively to reach their shared goal. A new area of research into goal setting is investigating how thinking about potential obstacles can help people achieve their goals. This may sound negative, but it actually isn’t, as long as it is followed by a conversation about how they will overcome these barriers. Research suggests that only thinking about the positives can do more harm than good, with these people doing worse in sticking to a diet, reducing their motivation and performing worse in exams. Understanding what your “why” is, and the importance behind your goals, can really help. Research suggests that getting students to identify why they are doing a task can help increase their motivation and engagement as well as how much they learn. You can read more about these studies here. Try to avoid vague terms when setting goals as this makes it harder to monitor the progress. Aiming to be better is a good thing. Clearly identifying which areas you want to improve is better. These sort of goals can play a key role in helping students develop their metacognition and self-regulation. For continuous personal growth and progress, setting goals that focus on improving your skills (and not just on what you want to achieve) will help. Most of the time the end outcome relies on being able to execute your skills under pressure. So make that what you are focusing on. As legendary American Football coach Bill Walsh used to say, the score will take care of itself. We can’t always predict how a situation may unfold, or have things happen the exact way we want them to. If the situation changes, goals may need to be tweaked. Monitoring, tweaking and amending your goals is the hallmark of a mature learner and leader. This will help maintain your motivation over long periods of time. Sharing your goals and aims with others can help. If other people know about them, they may be able to help you. An outsider may come up with different and better ways to reach certain goals, ways that you may have overlooked before. Social support has been found to be highly valuable in both sport (and we think in education too). Therefore, don’t be afraid to share your goals and ask for help. Trust is a big mediator of behaviour. In a famous study, participants were told not to eat the marshmallow in front of them. If they could wait for a while, they would be rewarded with two marshmallows. Those that did not trust the person giving them the instruction were only able to wait for 3 minutes before giving in to temptation; whereas, those that trusted the instructor were able to hold out for over 12 minutes. If people don’t believe what they are being told, their motivation and determination to achieve a goal will suffer. Monitoring your goals is an important process as it helps to ensure that your goals are translated into action. Monitoring progress needs to occur frequently. It is easy to start with good intentions, but when left alone, people often fall back into old habits. That’s what makes monitoring your goals such an effective strategy. Goal setting doesn’t need to be seen as such a daunting task. In the past, when done wrong, it can actually demotivate people. The above simple tips offer an idea of how to effectively set targets. Goal setting should be a continuous process. If there is flexibility, short and long term goals, that focus on developing skills that are monitored and supported by others, it should help. For even more info take a look at our page How to Improve Metacogntion, where you’ll find links to blogs and research.